The Med Ed Hour features a variety of medical programs aimed at physicians, nurses and other health care professionals who wish to expand their knowledge base, keep current on the latest research, and in some cases, earn Continuing Medical Education credit. 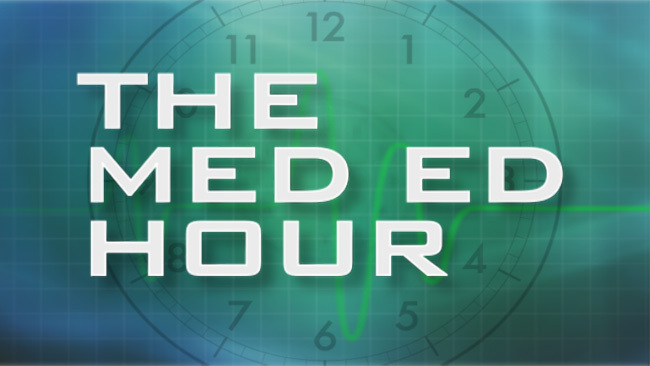 The Med Ed Hour airs on UCTV every Tuesday, Wednesday and Thursday from noon to 1:00pm (Pacific Time) and covers the latest developments in health care including smallpox, hormone replacement therapy, Alzheimer's disease and more. Emily Bergsland, MD, from UCSF. Thomas Hope, MD, from UCSF. Pamela L. Kunz, MD, from Stanford. Dora Raymaker and Clarissa Kripke. Yvonne Wu, MD, UCSF School of Medicine. Christina Buysse, MD, Helen Phung, PT, Patty Walsh, OTR/L. Jennifer Dresen, & Joanne Rolle, The Arc San Francisco. Paul Glassman, DDS. University of the Pacific, Dentistry. Yvonne Maldonado, MD - Stanford. Dr. Juan Celedon of the University of Pittsburgh. Cancer risks associated with BRCA. How innovation helps shape health policy. Tackling complex questions about healthcare. Honoring the perspective of those with disabilities. Susan P. Mizner, JD. Disabilities Counsel, ACLU. Leslie Rubin, MD. Morehouse School of Medicine. The impact and possibilities of rare disorders. Genome sequencer looks ahead to what's next in research. Elissa Epel and Janet Napolitano. Interventions to curb obesity in children. What is really addictive in food. How we are wired for food addiction. The effects food on the brain and behavior. What triggers the addictive process in food? New findings on how to change eating behavior. Curbing food addiction and obesity. Pro and Con from two UCSF doctors. Genomic tools to improve transplant health outcomes. Pros and cons of 6-month rule. Dr. Norah Terrault, Viral Hepatitis Center, UCSF. Dr. Ryutaro Hirose, UCSF Professor of Clinical Surgery. Dr. Danielle Brandman, Division of Gastroenterology, UCSF. Dr. R. Kate (Katie) Kelley, UCSF Department of Medicine. Elissa Epel, Director of COAST, opens the 2015 conference. Rob Knight, PhD, Department of Pediatrics, UC San Diego. Susan Lynch, PhD, Medicine/Gastroenterology, UCSF. Panel discussion and final remarks. Linda C. Giudice, MD, PhD, MSc, UCSF. California Summit for Transition Age Youth. Exploring self-determination services in California. Implementing Social Interventions for High School Students with Autism: A Recipe for Success! Social interventions for high school students with autism. Community integration for those with disabilities. ESDM - an early intensive behavioral intervention program. Understanding the neural basis of autism. Brain function and treating malfuntions. Science that connects diet, nutrition, and oral health. Presentation related to nutrition, sugar, and oral health. Prenatal exposure to a common neurotoxicant. Recent genetic studies and autism. Challenges and opportunities in new treatments in autism. The Common Core State Standards and students with autism. Doctors Feng, Freise and Webber on new kidney allocation. Minnie Sarwal, MD discusses personalized medicine. Jennifer Price, MD discusses the new era of hep C cure. How to optimize high risk infant developmental. John Roberts, MD on kidney transplantation at UCSF. Flavio Vincenti, MD on UCSF kidney transplant program. Dr. Cowan on Severe Combined Immunodeficiency (SCID). Challenges faced by high school and college students. Understanding the causes of dyslexia. Using electronic tablets for neurodevelopmental disorders. Effects of Portal Vein Thrombosis on transplant mortality. Recognizing & managing liver diseases unique to pregnancy. Oral therapies available for Hepatitis C.
Chris Freise, MD discusses A2ALL Liver Transplants. Debate of Beta-Blocker vs. Band Ligation in Hypertension. Conference introduction to liver transplantation topics. History & current state of organ allocation distribution. Discussion of liver transplant and heptocellular cancer. Patient and doctor on Crohn's now and in the future. Tiered approaches for childhood developmental screening. The biology of molecular and cellular processes. The detection of genetic variants associated with ASD. The biology and treatment options for kidney cancer. Differences in developmental trajectories in ASD. Recent developments in the epidemiology of ASD. A deeper understanding of ASD. Which patients may benefit from a DBS consultation. The history and future of pediatric medicine. Various roles of cilia in cellular function. Transformative strategies for health care reform. Global burden of disease for mothers and children. Recent data on burnout and depression in physicians. Injury and evolution in a newborn's brain. Transcatheter and hybrid interventional procedures. The case for the virtual crossmatch. Basic imagery techniques for pediatric neuroimaging. Trends in behavioral health over the last several decades. Current research in kidney transplantation at UCSF. The metrics of quality care at transplants centers. Genomic monitoring of transplant patients. A summary of current research in kidney transplantation. Recent progress in the creation of the artificial kidney. Dr. John Stobo opens the 2014 colloquium. Carl Dvorak, President, Epic Systems Corporation. Global health doctor on curbing chronic diseases. UCSF Kidney Transplant 2013: Donation vs. Desensitization. Autism Outcomes and Risk Factors: What Can We Learn from Health Care Claims? Using public health data for autism research. Tansition of teenagers with autism to young adulthood. Global HIV/AIDS at the Crossroads: Where Do We Go From Here? Explore the current state of global HIV/AIDS. Management strategies for T1 HCC 1-1.9cm. Where you live determines your life expectancy. Nutrition recommendations for liver transplant candidates. Treatment options for autoimmune liver disease. The intricacies of live donor liver transplant. The epidemic of pediatric fatty liver disease. Current treatments for transplant patients with HIV. Norah Terrault, MD, MPH on the treatment of Hepatitis C.
Current trends and goals in the field. Language and communicative development with ASD. Methods used to study functional interaction and networks. An update on Down syndrome, its impacts and treatments. The role of environmental exposures in autism. Update on Affordable Care Act and CA SB 946. Difficulties in diagnosis of children of preschool age. Review of promising new medications. Treatment for children with disruptive behaviors. The association between BPA exposure & breast cancer risk. A systems approach to patient safety. David Lansky on employer's perspective. How to achieve triple aim. Innovations that facilitate triple aim. Enhancing patient experience & increasing value of care. Improving access to specialty care. The effect of toxic flame retardant chemicals. John Stobo and Terry Leach open the 2013 colloquim. Breast cancer and environmental exposure during puberty. Improve quality, advance health and lower costs. Protection of the breast conferred by full term pregnancy. Breast cancer risk in utero. Menopausal hormone therapy and risk of breast cancer risk. Breast cancer and the timing of menarche and menopause. Breast cancer and environmental exposure during menopause. Effect of obesity in the basal-like microenvironment. Estrogenic mycotoxins or mycoestrogens in development. How puberty impacts the risk of disease later in life. Environmental chemicals in breast development. Threats posed by chemicals to our environment & health. The potential for environmental factors to impact health. How to manage hepatitis C before and after transplant. Breast cancer and environmental exposure during pregnancy. The issues involved when using a living kidney donor. Endocrine disruptor, dietary fat and breast cancer. Future of research on breast cancer and the environment. Belatacept's impact on the transplant community. A look at the current state of kidney transplantation. A look at therapy options for ischemia-reperfusion. Managing hepatocellular carcinoma before transplants. Current trends in organ allocation in the United States. A look at the causes of and how to diagnose CAN. The causes and risk factors of Ischemia-reperfusion DGF. Bariatric surgery for patients with cirrhosis. The current status of the UCSF liver transplant program. CAN treatment options for kidney disease patients. improving patient safety in medical imaging. Nutritional status and neurodevelopmental outcomes. The genomes of children with developmental delay. Conceptualizing autism as a social learning disability. Pharmacologic and biomedical treatments for autism. Physical activity is factor in sleep duration & obesity. The complex associations of sleep, stress, and biology. Sleep's role in learning, memory, and brain development. Racial, Ethnic and Socioeconomic Sleep Disparities: A Key Factor in Health Disparities? How sleep is affected by race and income level. Carla Shatz on immune genes moonlighting in neurons. Sleep and obesity and the early origin of disease. Sleep deprivation and the response to food desire. Sleep loss is a risk factor for obesity and diabetes. Epidemiology of sleep and obesity. Impact on weight gain and obesity in women. How practitioners can take advantage of research. Quality innovation and improvement in health care. An in-depth look at T-reg interventions. Acute Liver Failure - What is New? When the liver rapidly loses its ability to function. Aging physicians: Canada's policies and how they work. Molecualr approach to treatments for liver cancer. Aging physicians: impact on clinical performance. How aging impacts physicians and the care they give. Substance use and mental disorders among our military. Exploring orphan or rare diseases. The ways positive thinking can improve one's health. Strategies to change the food environment. Current state of research into food and addiction. Transforming people's relationship to food and eating. A method of treating obesity and stress symptoms. Insight into caloric restriction from a practitioner. Food and Addiction: What is Food Addiction and How is it Measured in Humans? Cognitive and neural processes of food addiction. What environmental factors contribute to obesity? Reducing Latina teen childbearing in California. Autistic scholar talks about her life, work. Animal Science professor discusses her own autism. Watch the MedEd Hour Tuesdays, Wednesdays and Thursdays at noon. ©2012 Regents of the University of California. All right reserved. Terms and Conditions of Use.